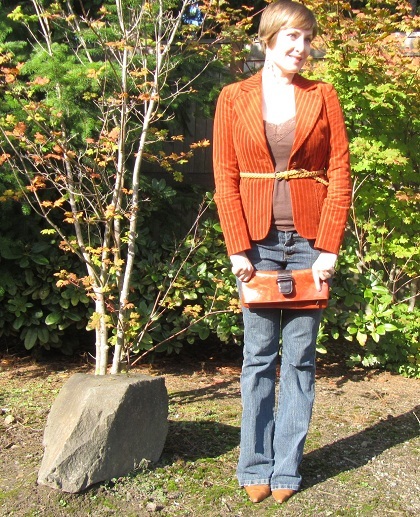 I recently wore wide-legged pants to work with a corduroy blazer. Later, when going out to meet friends, I wanted to look a bit more casual, so I switched pants. It’s amazing how one simple change can alter the whole look of an outfit. I added the scarf for work because the tank was a bit low-cut. I also carried a Shiraleah clutch so I could stash away my keys and phone. I like how the slingbacks look like boots with long, bootcut pants (as long as I’m standing up). So before buying new boots, have a look at your shoes. Can you wear a dress shoe with casual pants? Perhaps wearing socks with a slingback is unorthodox, but it was my little secret. I’ve doubled my shoe wardrobe, in one fell swoop! I love that blazer so much…the color is amazing, great find! Also, are you a fellow Seattle-ite?! I love this color combo, Jean! Like how you wore the belt! Thanks Sarah! The color and texture was too good to pass up. I love the jacket and the belt! This is one of the outfits I like wearing in normal days.